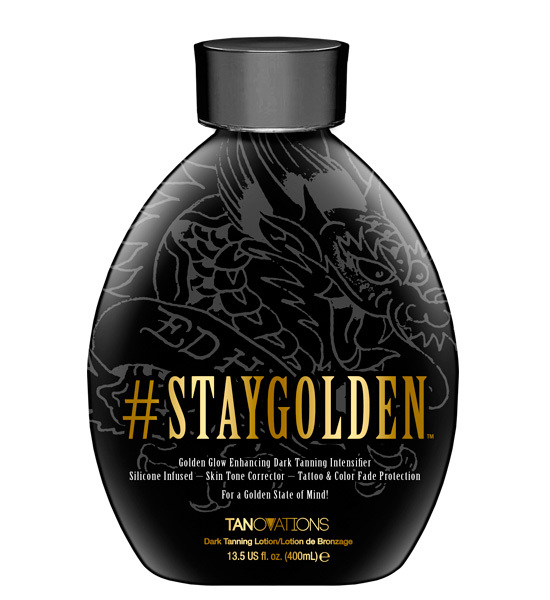 If your goal is a golden glow, then create, maintain and prolong your color with #StayGolden™! This ultimate bronzer-free intensifier utilizes 4 different dark tan activators, color correctors, and detoxifying agents to help you STAY GOLDEN! • Tanning intensifiers deliver dark golden results without the use of bronzing agents. • White Charcoal – Powerfully reduces skin’s impurities such as excess oil, clogged pores and also helps reduce the appearance of breakouts. • White Birch – Restores firmness and soothes troubled skin. • Phloretan™ – An antioxidant that helps even skin tone and prevent the formation of wrinkles. • Tamanu Oil – A powerful skin regenerator, aiding in wrinkle reducing, blemish- fighting and moisturizing dry skin. Helps to hide the appearance of scars and stretch marks. • Quad Tyrosine Blend + MelanoBronze™ - Stimulate and increase melanin formation to accelerate the tanning process. • Tattoo & Color Fade Protector - Prolongs the life and radiance of your tattoos and tanning results.